5 reasons Pokémon GO will benefit farmers, consumers. I raised children in the 2000s. And I am one of the 7.5 million who downloaded Pokémon GO. As I see it, if I had to listen to my kids run around the house yelling, "Pikachu, I choose you," and watch them throw a real red "Poké Ball" around my home destroying objects, well, I deserved to get in on the real time gaming action. What I found was that Pokémon are all over the countryside and it might bring consumers closer to the farm than ever before. 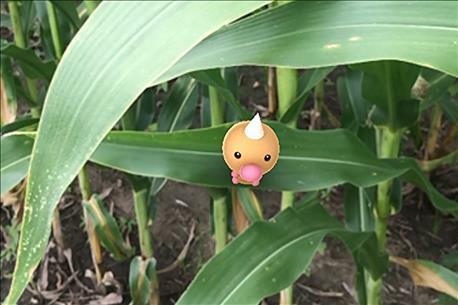 POKEMON HUNT: My daughters captured an aptly named Weedle Pokémon in a cornfield. Pokémon GO is the latest global craze and may provide farmers a unique opportunity to interact with consumers. For those of you who might not know of the latest gaming craze, Pokémon GO allows users to link the real world and virtual world of Pokémon with their smartphones. As you walk around your smartphone will vibrate to let you know you are near a Pokémon. Then you touch your screen and throw a Poké Ball to catch it. There have been Pokémon cartoons and games, but this app brings the user straight into the real world to collect Pokémon. The company website says this of its new app: "Get on your feet and step outside to find and catch wild Pokémon. Explore cities and towns around where you live and even around the globe to capture as many Pokémon as you can." And this is where I think farmers may find an unlikely opportunity to interact with today's consumer. In searching for Pokémon with my daughters--yes, it can be a family activity--we spotted them along country gravel roads and cornfields by our home. So here are my 5 reasons why Pokémon Go is good for farmers. 1. Consumers visit farm country. Consumers want to know where their food comes from. This game takes individuals to places they may never visit. So many consumers may drive the extra 30 minutes to farm country to see if they can find a rare Pokémon. It might give them a better understanding of how we farm and live in rural America. 2. Consumers interact with crops. My daughters caught a Weedle by a cornfield in the river bottoms. This may be the first time consumers see corn up close. Consumers may not realize that it is about 15 feet tall and only produces one or two ears. It is a good learning experience for both parents and children. 3. Consumers learn about raising animals. Pokémon can be found around farms with animals. While we did not find any in our sheep pasture, they were along the edge. Consumers searching for Pokémon in farm country will be able to see how we take care of our animals. They will see it with their own eyes and not on an edited internet video. 4. Consumers may meet a farmer. You never know when individuals will be searching for Pokémon. Farmers in the middle of chores or checking crops may come upon consumers on the hunt for Pikachu. Take advantage of these opportunities. It is the time for farmers to show consumers we have nothing to hide. Explain about where they are and what they are seeing--other than the Pokémon. 5. Consumers will see farmers are tech savvy. Let's be honest. There are a few farmers out there searching for Pokémon while scouting crops. Realizing this is a game and understanding consumers' fascination will only help bridge the gap between consumer and farmer. As farmers, let's take advantage of this worldwide phenomenon. If consumers come out our way to catch a Pokémon, let's make sure they understand the agriculture story before they leave.